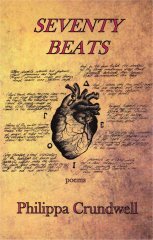 Philippa Crundwell’s first collection, Seventy Beats, stands out not least because of the incredible range of various voices and personae other than her own, which in a writer not yet twenty years of age is nothing less than astonishing. This is a book which sets down a marker, a book which says "here is a new voice”, a book which introduces a name to watch out for in the future, one which, if the author does go on to fulfil the tremendous early potential contained in these pages, it will be impossible to ignore. You heard it here first. Philippa Crundwell won the Ocado/Peace One Day UK-wide poetry competition in 2013 at the age of only 15, with her Poem For Peace. She has lived in West Sussex all her life. She wrote her first poem at the age of five and hasn’t been able to stop writing poems, short stories and plays ever since. Also an ambassador for New Writing South, and one of the creators of the Writers’ Manifesto, she is passionate about the importance of creative writing in education and believes writing is something that should be available to everyone everywhere. "I’ve been really impressed... by the breadth of subject matter and depth of maturity of Philippa’s poems. She shows a maturing beyond her years. - PETER JAMES, international best-selling British writer. What is 13 - 9 ? The writer captures emotions through wonderful metaphor and imagery. An emotional journey for us all to explore! I was most impressed with the maturity and perception of this young writer. Her poems were thought provoking and left a lasting impression on the reader. A lovely book - very heartfelt poems. Well done Philippa...Looking forward to the next edition ! This book shows maturity empathy beyond Philippa's years. Heart felt poems - brilliant! I wouldn't normally pick up a poetry book, but after flicking through this one, I just couldn't put it down. Such brilliant writing for someone so young! Amazing. I have known Philippa for a long time, and she is one of those few individuals who have always known what their passion in life is. Luckily, writing is also something she is incredibly talented in. She really does deserve the recognition she is getting, and every bit of success she receives for Seventy Beats and any future work. Vote for Seventy Beats!